UK advertisers spent more on mobile than TV for the first time in 2017, the latest Advertising Association/Warc expenditure report shows. Mobile adspend in 2017 shot up 37.3% year-on-year to £5.22bn. 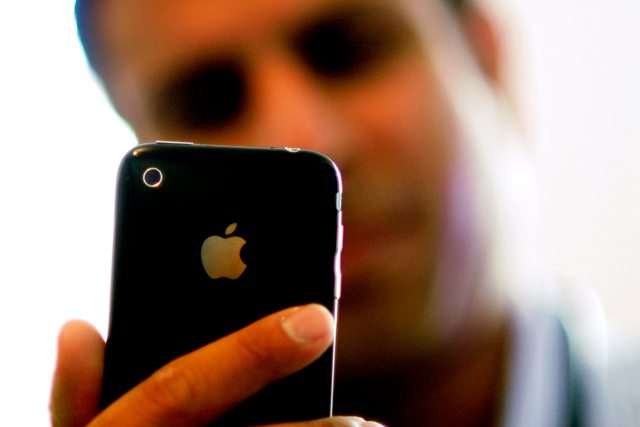 It accounted for 45% of all internet adspend, which was worth £11.6bn – up 14.3%. But spend on TV was down 3.2% to £5.1bn, after remaining virtually flat in 2016. Internet advertising accounted for 52% of the total adspend for 2017 (£22.2bn) – the first time it was worth more than all traditional media combined. 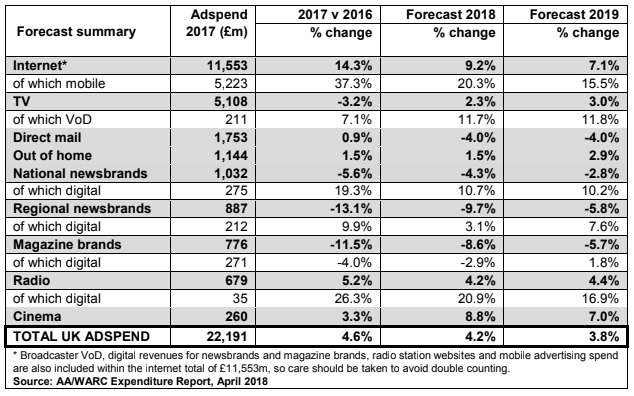 The report also forecasts that adspend in the UK this year will grow 4.2% in 2018 to £23.1bn – considerably better growth than the 2.8% forecast in the previous report in January. Growth in 2017 was also considerably higher than previously expected – 4.6%, compared to the previous estimate of 3.4%. This year’s growth will be followed by 3.8% growth in 2019, taking the market to £24.0bn, the report forecast. The report forecast that adspend on internet, and mobile in particular, would continue to grow handsomely for the next two years, but at a low rate each year. TV is expected to grow again in 2018, but it will take two years before spend on TV catches up to its 2016 level. Elsewhere it was a good year for radio, spend on which grew 5.2% to £679m, and cinema, up 3.3% to £260m. Spend on national newsbrands fell, but at a slower rate than in 2016, thanks to a 19.3% increase in digital spend. But there was no respite for regional newsbrands or magazine brands, both of which suffered double digit declines. Stephen Woodford, chief executive at the AA, hailed the "strength and resilience" of the ad industry. "The UK is a hub for the global ad industry and, with our expertise and creativity, I am hopeful we can continue this run of success into the future," Woodford said. "This success, however, is also reliant on getting the right deal from Brexit for our industry and ensuring we have access to the best talent to ensure British advertising remains a global powerhouse." James McDonald, data editor at WARC, added: "The latest verified results illustrate a dynamic market, one which has now expanded for 18 consecutive quarters. "Mobile continues to underpin growth – over 90% of additional mobile investment was directed towards search and social media in 2017 – yet there was vitality across the wider industry. "We believe TV’s dip, caused mostly by reduced spending within the consumable goods category, is anomalous, and expect the channel to rebound this year thanks in part to the summer’s World Cup."